Last night was an actual procrastination recipe. 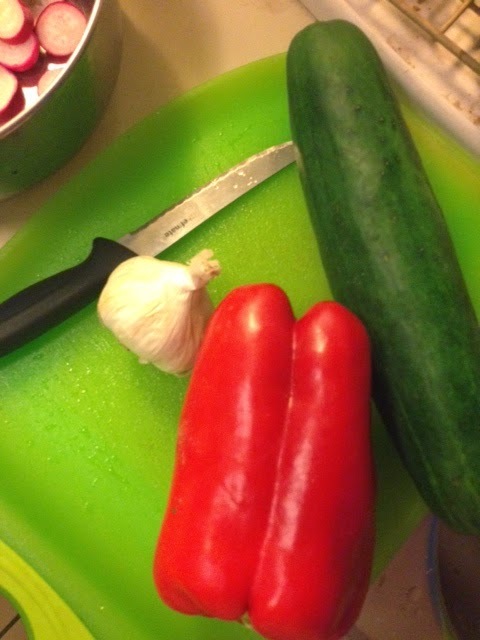 I had plans to write but then between pickling and making dinner and then getting sucked into Who's Line Is It Anyway, the night slipped away from me. That seems to happen a lot. Quick story before we get into the pickling. So last Thursday was the first of many weeks to come of receiving veggies from a farm share that I'm splitting with a friend. I received lettuce, spring mix, kale, radishes and what I really, truly thought was celery. It was all green, shaped like celery. So I cut it up and brought it into work with a side of peanut butter and was excited to have a snack yesterday afternoon. I dipped it in the pb, bit into it and started to chew. This lemony, sourness overtook my mouth. Not celery. After tweeting the farm I discovered it was in fact rhubarb. I thought rhubarb was red. I had no idea. And then all afternoon my stomach churned. I don't think you're supposed to eat raw rhubarb. But at least it was an entertaining break in my day. 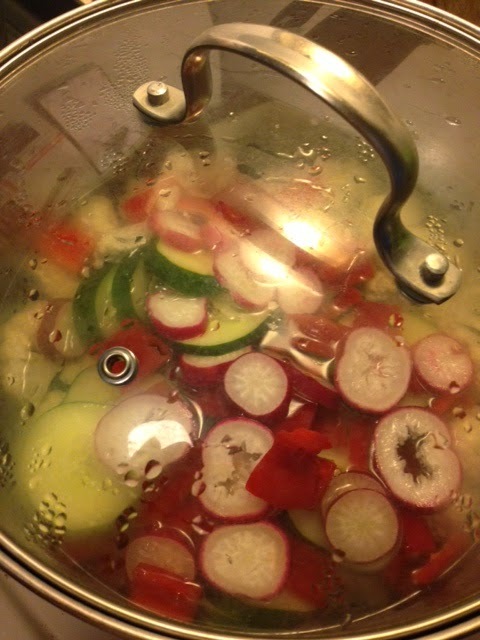 So back to pickling. A year or so ago I got really into make jam and jellies. But man, is that an extensive process. 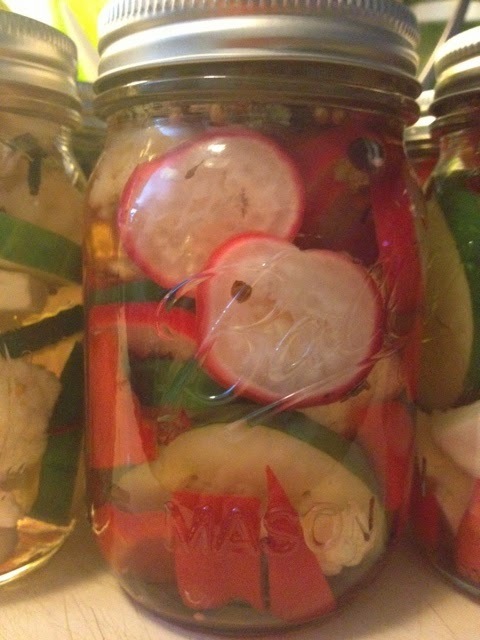 Pickling... so much easier. And less mess. 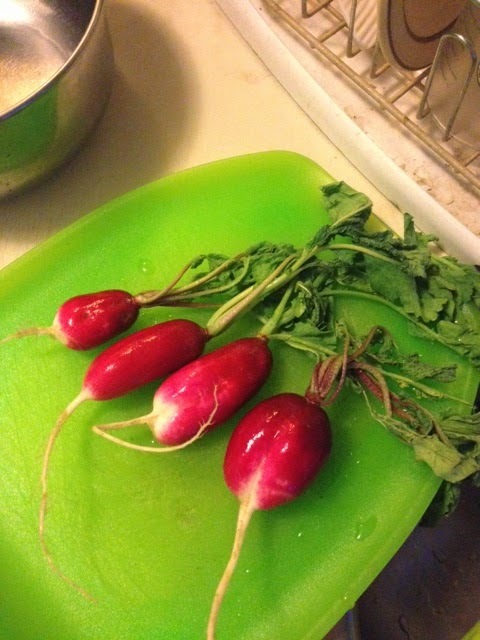 I wasn't sure what to do with the radishes from my farm share until a coworker suggested pickling. She had received my hot pepper jelly before and knew I am into all that jazz. Thank you to her for planting this idea. As a quick note: I have not yet tasted this, since i just made it last night. So I can't speak to how great it is yet. Cut up the veg however you choose. 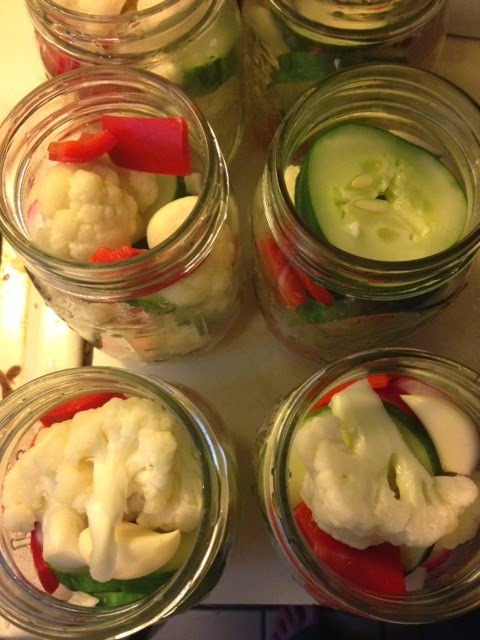 I sliced the radishes and cuke, diced the pepper, and pulled the cauliflower apart in natural trees. Boil in water for 2 minutes, remove from heat and put in a cold water bath to prevent further cooking. 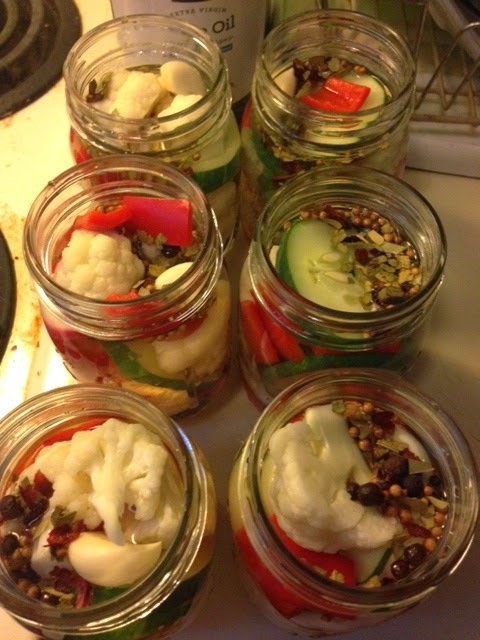 Divide the veg between 6 canning jars. 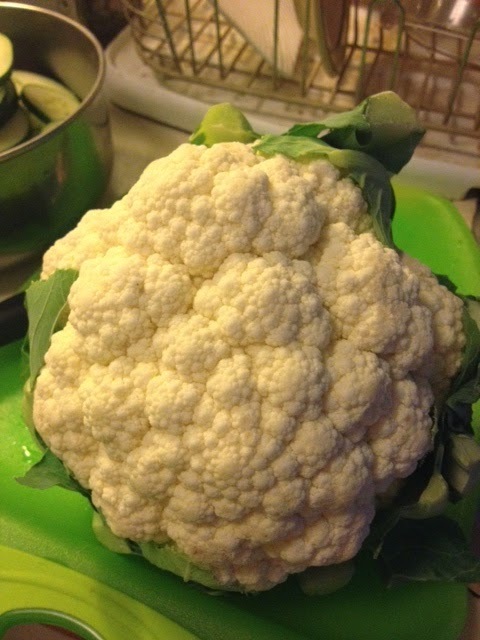 Don't smoosh the veg in or the cauliflower will break, but fill it as best you can. So there I was in the baking aisle looking for my black peppercorns, mustard seed, dill seed, thinking to myself, Dangit, this is adding up. I try to be somewhat money conscious when I grocery shop, though it doesn't always work out. 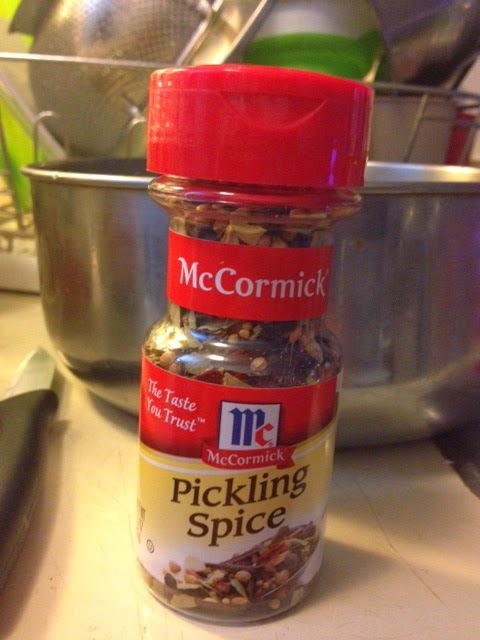 And them McCormick came out of nowhere for the win with a single container of pickling spice. Bank account saved! So I peeled my garlic and stuffed an entire clove in each jar (good luck to the friends I gift these to!). Then I poured 1 teaspoon of pickling spice in each jar. In a bowl, combine vinegar, water, salt and sugar. Stir until the sugar/salt dissolves into the liquid. Then pour into the jars until it reaches the place where the lid screws down to. Don't overfill, especially if you plan on pressure sealing the jars. I opted not to pressure seal because that would be another half hour of work and I'm planning on gifting the jars this week. The contents are good for two months so it'll be fine. And usually when I gift jams/jelly I hear from my friends that they opened it immediately, so what's the point in pressure sealing it? Cut out the extra work. I recommend keeping the jars in your fridge for at least 3 days before gifting and each day give the jars a shake so the spices can get all over and flavor each item within. Then make sure to share with friends and family!